How Much Does a Dental Lab Technician Make per Year? A dental lab technician uses molds to make orthodontic appliances and dental prosthetics, including crowns, bridges, and dentures. In the US, dental lab technicians earn an average annual salary that is well over $44,000 per year compared to more than AU$67,000 ($51,001 USD) in Australia. In US dollar currency, annual salaries in New Zealand, Canada, and the UK are similar at roughly NZ$56,000 ($38,758 USD), C$44,000 ($34,459 USD), and £27,000 ($32,286 USD), respectively, while those in South Africa earn about R175,000 ($12,748 USD) compared to Rs211,000 ($3,266 USD) in India. This guide’s evaluation of earning potential for dental lab technicians requires examination of geographic region, professional experience, and work setting. Annual and hourly earnings for dental lab technicians worldwide are found in the chart below. While salary ranges for dental lab technicians vary by professional experience and work setting, geographic region appears to affect earning potential to a greater degree. The following paragraphs include salary and career information for dental lab technicians worldwide. In the US, dental lab technicians see annual earnings top $44,000 per year, equivalent to $21 per hour. Some employers offer bonus income incentives that can add another $700 or more to overall earnings. Newly trained dental lab technicians see starting base salaries at about $33,000 per year while those in senior level positions earn nearly $54,000 annually. In Canada, dental lab technicians earn close to C$44,000 per year, with an additional C$700 in bonus income. Those paid an hourly wage receive an average of C$21 per hour. Starting salaries for new dental lab technicians is well over C$32,000 per year, increasing to more than C$53,000 annually upon reaching the senior level. Dental lab technicians in the UK earn an average annual salary ranging from about £20,000 at the entry level to more than £33,000 at the senior level. When looking at all experience levels for dental lab technicians, the average annual salary is more than £27,000 per year, or £13 per hour, with an additional £400 in bonus income potential. Dental lab technicians in Australia earn more than AU$67,000 annually, or AU$32 per hour. Some employers offer bonus income opportunities boosting overall incomes $1,000. As an entry level dental lab technician, annual pay is about AU$50,000, while senior level positions offer an average annual salary that tops AU$81,000. As a dental lab technician in New Zealand, annual pay is more than NZ$57,000 with bonus pay adding NZ$900 or more to overall earnings. Those paid an hourly wage receive NZ$27 per hour, on average. Early career dental lab technicians earn about NZ$42,000 per year, increasing to over $68,000 per year for those in senior level positions. Dental lab technicians in India receive an average annual salary of nearly Rs211,000, or Rs101 per hour, plus another Rs3,400 in bonus pay. Entry level dental lab technicians are paid an average salary of roughly Rs159,000 per year, increasing with experience and responsibility to about Rs260,000 annually. 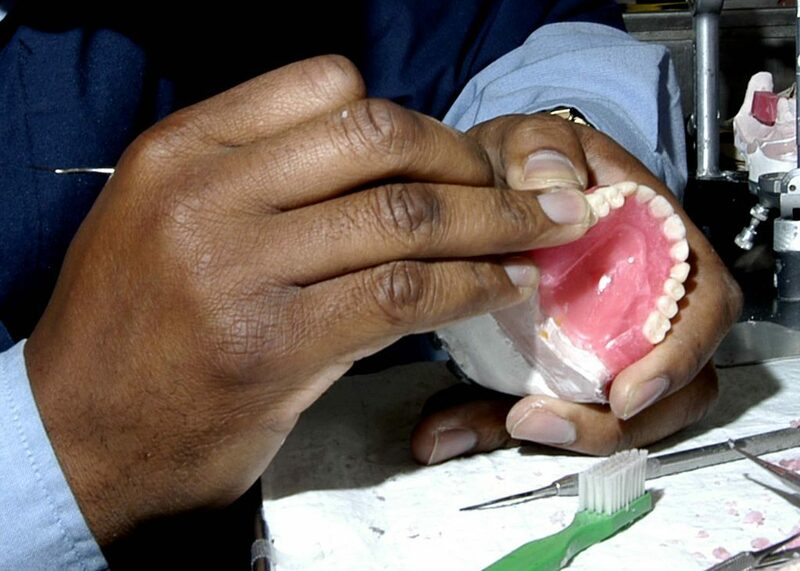 In South Africa, dental lab technicians earn about R175,000 annually, or R84 per hour. Bonus income potential can boost total earnings by nearly an additional R3,000. Entry level dental lab technicians can expect an average starting salary of about R131,000 per year compared to R214,000 per year upon reaching the senior level. With experience and additional responsibilities, dental lab technicians see earning potential increase between 62% and 64% worldwide. The difference between entry level and senior level pay in the US is about $21,000 per year, or 64%, while this increase is NZ$26,000 per year, or 62%, in New Zealand. Dental lab technicians have little to no patient contact as they are employed in laboratories where dental prosthetics and orthodontic appliances are created. Orthodontists are generally those who speak directly with patients. Due to the specialized nature of their work, there is little difference in salary from employer to employer; however, larger laboratories with a higher volume of work may offer higher pay and bonus opportunities compared to smaller companies. While many dental lab technicians are employed full-time, there are ample opportunities for part-time employment. Typical work hours are Monday through Friday during normal business hours, though there may be times when additional work hours are necessary. While full-time employees may receive healthcare coverage that includes medical, dental, and vision services, those who work part-time may be ineligible for these benefits or may receive a smaller package. Some employers also offer bonus incentive pay; however, these earnings do not greatly boost overall income. Paid time off for vacation, holiday, and sick time is also sometimes offered. The US Bureau of Labor Statistics anticipates a 13% growth rate from 2016 through 2026 for dental lab technicians. This represents a faster than average rate of growth due to an aging population that is more frequently in need of dentures, bridges, and crowns. Additionally, increased access to orthodontic services will positively affect this growth rate. To work as a dental lab technician, the minimum of a high school degree is required, though some acquire post-secondary education, and most training is completed on the job. Dental lab technicians earn salaries that are reflective of the education and training required for this position, which are lower comparatively lower than other healthcare positions. Some employers offer benefits and bonus packages; however, overall earnings are not greatly affected by this bonus pay. A faster than average rate of growth for dental lab technicians is expected in the coming years.